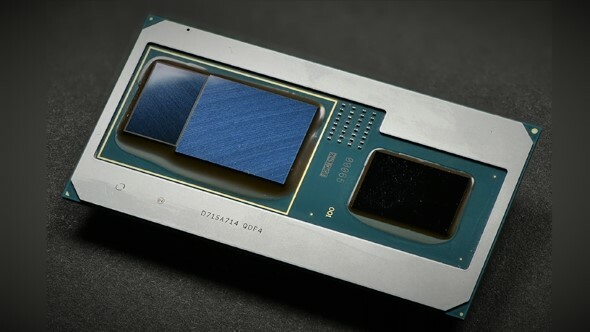 The new Intel Vega M G-series processors, the lovechildren of the unholy coupling between the Core CPU architecture and AMD Vega GPU tech, look like rather stunning bits of silicon. But the promise of gaming laptops, without the hot and hungry traditional GPU, could be all for naught if Intel price them out of the market. If you’re happy pairing with a proper graphics card then these are the best CPUs for gaming right now. That might seem blindingly obvious, but it is the way Intel have approached similar situations in the past. So while yes, the idea of slapping a mega price-premium on the new chips would appear rather foolish, it’s not that unlikely. The old Iris Pro days promised laptop graphics, without discrete GPUs, that could produce decent 720p gaming performance on their own. Unfortunately Intel only dropped the top graphics parts into their most expensive mobile CPUs and that meant you would have to pay more for an Iris Pro laptop than for one with a more powerful discrete graphics card inside it. 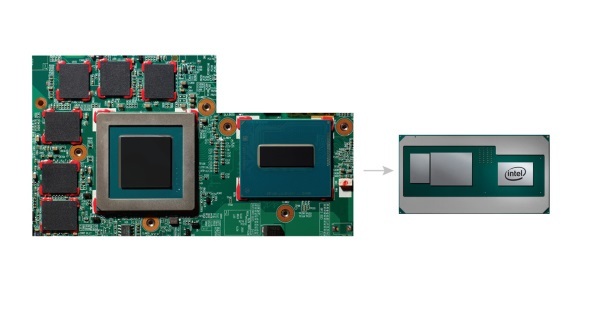 In their recent announcement, however, Intel have introduced us to their new G-series chips and their powerful AMD Vega graphics components. And I’m hoping they’re going to learn from their mistakes. Pricing aside, the important numbers for us on their new chips are the amount of GCN cores in the semi-custom GPU designs donated by team Radeon, and the performance delta between the different G-Series based machines and their discrete GPU powered rivals. Both of which look mighty exciting, especially given even the Core i5 G-series chip is packing 20 Vega compute units (CUs) and therefore 1,280 Graphics Core Next (GCN) cores. With that Intel are proposing gaming performance that will outpace a laptop sporting a discrete GTX 1050 by somewhere around 30 – 40% judging by their 1080p Hitman and Deus Ex: Mankind Divided benchmarks. The higher-spec chips – the 100W, resolutely Core i7 parts with 24 Vega CUs and 1,536 GCN cores – are expected to be around 10% quicker in gaming benchmarks than a machine running a GTX 1060 Max-Q design GPU. 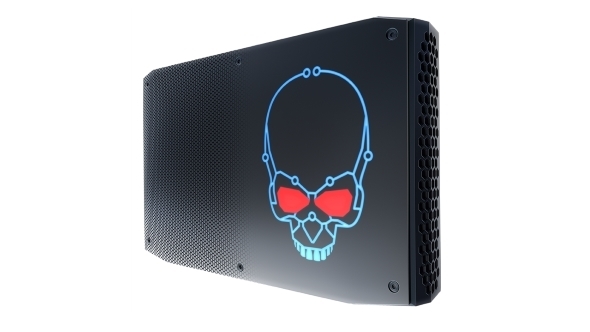 That’s all very impressive, but they’re already being spoken about by Intel as their premium processors, despite the fact they’re sporting last-gen Kaby Lake CPU silicon and not the six-core Coffee Lake mobile designs we’ve been waiting on. And that premium placement means they’re going to go into high-spec laptops which demand an equally high price. The chances of the i5 8305G, the HyperThreaded quad-core with 20 Vega CUs, appearing in a sleek sub-$1,000 laptop are pretty remote, but that’s exactly where the current GTX 1050-based machines are sitting. If Intel really want to give Nvidia a bloody nose on the gaming laptop front then they need to be more aggressive on pricing than they have been in the past. And Krzanich has stated that he wants Intel to become a less risk-averse company this year, so maybe we’ll see something special on that front. The difficulty here is that they can only be responsible for how much they charge the laptop manufacturers for the privilege of using their new G-series chips; they can’t dictate the overall pricing of a Vega M-powered laptop. Well, actually they probably could if they wanted to incentivise laptop makers in the same way they did when they were pushing AMD out of the notebook game. But I don’t think they have the ready cash or the inclination to go down that route again. And besides, Intel want to keep eating their cake too; they’re still going to be pairing their future six-core Coffee Lake-H CPUs with discrete Nvidia graphics cards in the high-performance gaming laptops of the future. If they really stuck it to Nvidia then there’s a chance another unholy alliance, one between AMD and Nvidia, could be forged in the mobile space, cutting Intel out of the loop at the very highest end. These new Radeon-powered Intel processors then are only supposed to cause Nvidia some concern around the low-end of the mobile GPU stack. And in that space AMD will also be directly competing with the semi-custom GPU they’ve just sold to Intel. The new AMD Ryzen Mobile laptops are pretty low-spec stock at the moment, with the Ryzen 5 2500U and Ryzen 7 2700U only offering eight and 10 Vega CUs respectively, but there have been reports of a mighty 28 CU Raven Ridge part in the offing, but in their recent roadmap update AMD have said nothing about such a high-spec chip. That might mean the 28 CU Vega silicon is actually the core at the heart of one of the new Radeon Vega Mobile GPUs. Whatever the reality, it’s a mighty fine high-wire act Intel are going to have to perform with their Vega M G-series CPUs. 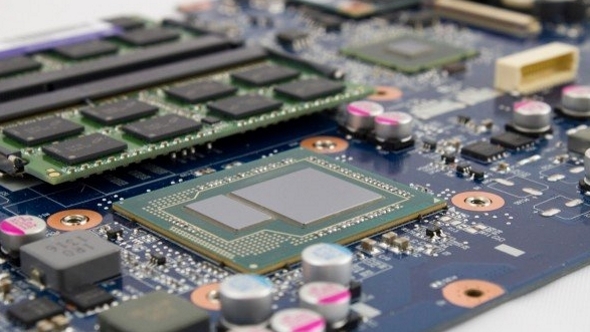 They need to offer manufacturers the potential for decent margins on their machines, while not pricing them higher than laptops sporting genuine discrete graphics cards. The mobile market is an increasingly competitive, lucrative space, but Intel have not historically had to fight their battles on a pricing basis, so it’s going to be interesting to see if they can this time around.